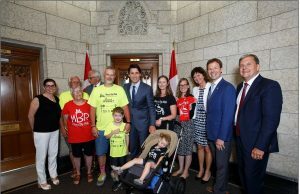 2018 is a very special year for Jesse’s Journey – it marks the 20th anniversary of John Davidson’s walk across Canada, and is also on track to be the year we grant our 10 millionth dollar to research! Join us for the 2nd annual Virtual Walk-Run-Roll! This virtual event is perfect for individuals, families, friends, or co-workers who want to raise funds to support Duchenne muscular dystrophy research and would prefer to walk, run, or roll in their communities. Click here for more information about the Virtual-Walk-Run-Roll and to register! Run or hike through beautiful forested trails, including the Cowichan Lake floating walkway. Click here for more details and to register. Join us on May 25, 2019 for the first Defeat Duchenne Family Forum and Celebration Dinner. 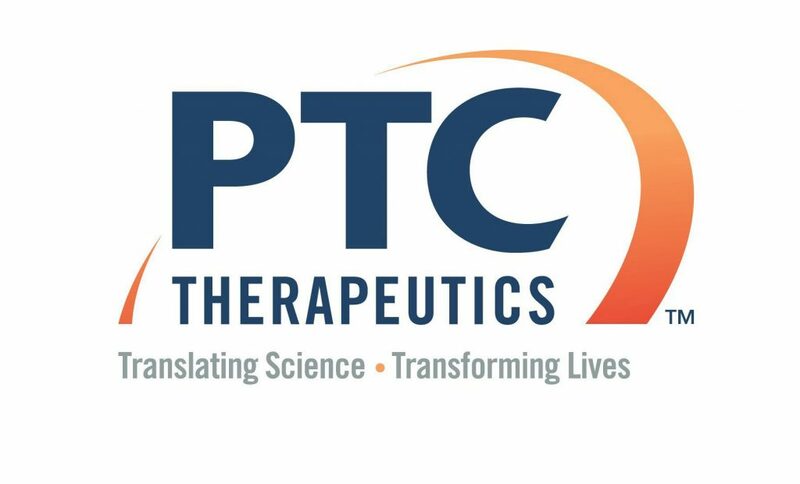 This unique event – tailored to families in Canada affected by Duchenne muscular dystrophy – will feature updates about the latest research, clinical trials currently recruiting in Canada, the International Preferences for Duchenne Treatments study out of Johns Hopkins University, and more. Register now for the Walk to Defeat Duchenne in Springbank Gardens, London ON. Create your personal fundraising page, collect pledges, and walk the route through Springbank on May 26! Click here for more details or to register. An automotive extravaganza like no other! 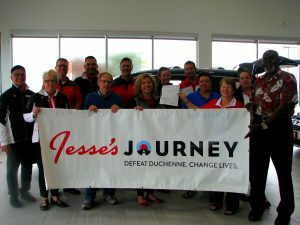 Jesse's Journey's newest fundraising event! Thank you to the Human Kinetics Students Association for hosting their second annual Indoor Volleyball Tournament for Duchenne Muscular Dystrophy! The event sold out and raised $900 for Duchenne research! Thank you! The Virtual Walk-Run-Roll has come to a close! Thank you to everyone who participated, pledged, and donated. Together, we logged 49,568,365 strides, and raised almost $28,000 for Duchenne muscular dystrophy research. What a great day we had at this year's Isaac's Trek for Treats! The morning was unseasonably cold (and snowy!) but we saw a great turnout and had some fabulous support! Thank you to everyone involved in the planning, supporting, donating, bidding, and trekking! The van Asseldonk family and their friends and community organized a fantastic and festive event. Check out some photos in our gallery here. Thank you to everyone who came out to this event! Stay tuned for fundraising updates and photos. Thank you to everyone who came out to watch, cheer on, participate, and donate! We had a great day at the Jet Aircraft Museum, and raised over $6,000 for Duchenne muscular dystrophy research. You can still donate or pledge a team here. Check out the video on YouTube and photos from the day in our gallery. Stay tuned for details of next year's Pull a Plane to Defeat Duchenne! The 10th annual Rice Lake Challenge was amazing! This event has been unstoppable, with so many ways to get involved over the years: The 4.5km swim across Rice Lake, the 101km cycle around Rice Lake, the 31km paddle along Rice Lake, Tyler's Walk, the 24-hour Tree Sit, and the Yes We Can golf tournament! Raising over $300,000 for Duchenne muscular dystrophy research over the last 10 years, we would like to thank everyone involved in the Rice Lake Challenge for all of your incredible work and dedication. You can still donate to this event here. Another anniversary event! This was the 10th year for the Brock Janes Golf Classic, held this year at Deer Run Golf in Ajax. A beautiful course and a beautiful day, we hope everyone had a wonderful time. Thank you so much to the Janes family and all friends, family, supporters and golfers. Over the last 10 years, this event has raised over $200,000 for Duchenne muscular dystrophy research. Thank you!! Another beautiful day for Tory's Tourney. Thank you to all who joined us for the 15th year! Check out some photos of the day here. You can still donate to Rob's Tree Sit here! Rob Tinney, of Tindall-Wharram Tree Service, once again perched high up in the east poplar tree in Victoria Beach Park, Cobourg, from 7am August 4th to 7am August 5th. The 24-hour Tree Sit is in its third year, and is part of the Rice Lake Challenge. This year's tree-sit raised over $2,600! A big thank you to Rob for taking on this fundraiser again, and to all those who supported and donated. Over 120 riders made their way up Sydenham Hill on Saturday. Well done and many thanks to all of those who participated in, supported, and organized this great event! The annual Jeff Preston Celebrity Golf Tournament in support of Muscular Dystrophy research was held at the Saugeen Golf Club in Port Elgin on July 20,2018. The tournament, largely because of celebrity support and commitment from Rotary and matching grants, has raised more than $1.3 million for MD Research, with over $120,000 supporting Duchenne muscular dystrophy research! Well the weather didn't cooperate this year, but we still had over 120 riders show up to complete the 6km and 29km Ice Cream Rides! The Ice Cream Ride raised over $5,000 for research. Thank you to all involved! Check out some photos from the day in our Photo Gallery. What a ride! Check out some photos from the road in our gallery. You can still donate to this amazing fundraiser here. If you're in Southwestern Ontario, be sure to check out the Ice Cream Ride on June 23rd, and Max's Big Climb in July 21st! Thank you to everyone who came out, walked, pledged, donated, and volunteered at this year's Walk to Defeat Duchenne! We saw a wonderful turnout and another year of great weather. So far the Walk has raised over $65,000 - and counting! Check out some photos of the day here. A huge thank you to the folks at London Honda for a very successful fundraiser! They raised over $2,000 for Duchenne muscular dystrophy research during their VIP sale weekend and charity BBQ. Over 200 guests took part in this gala event (hosted on what would have been Jesse's 38th birthday), celebrating 20 years of hope and innovation in Duchenne muscular dystrophy research. Thank you to all who made this event possible! The University of Ottawa HKSA hosted a volleyball tournament in support of Duchenne muscular dystrophy research. Thank you to all involved in organizing and playing! An impressive $720 was raised for Duchenne research. 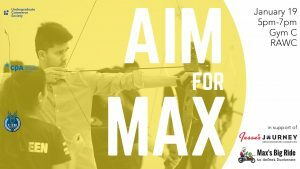 An event for UTM students, staff, and faculty, Aim for Max is a charity event that helped raise awareness for Max's Big Ride. Participants learned to shoot arrows for a fee, with all proceeds going to Jesse's Journey! Presented by UTM Archery, UTM CPA, and Undergraduate Commerce Society.